Soybeans closed unchanged. Soymeal, soyoil and wheat closed lower. Corn closed higher. US Dollar was higher. Crude was lower. Soybeans closed unchanged. USDA lowered US crop but also lowered US soybean exports, China imports and raised World carryout. USDA estimated World 2018/19 soybean carryout near 112.0 mmt vs USDA October estimate of 110.0. USDA lowered the Argentina crop 1.5 mmt, lowered China imports 4.0 mmt and raised Brazil exports 2.0 mmt. 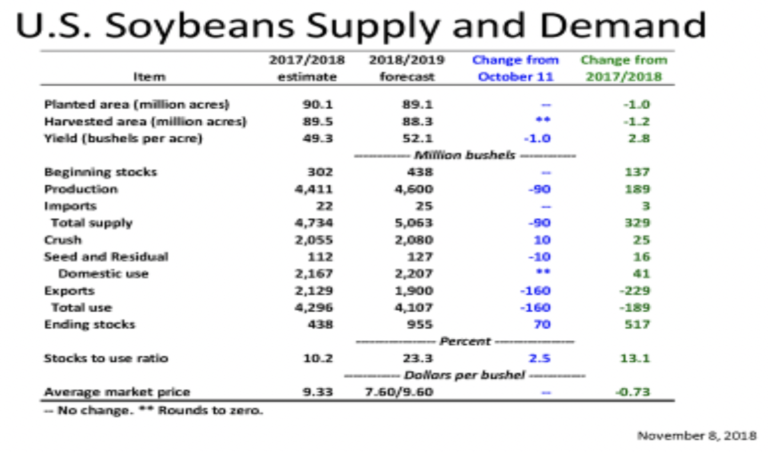 Trade estimated US 2018/19 soybean carryout near 898 mil bu. USDA October estimate was 885. USDA November estimate is near 955. Crop was lowered 90 mil bu, crush was raised 10 and exports were lowered 160. USDA lowered US soyoil carryin 212 mil lbs and raise domestic use 100 mil lbs. USDA raised US soymeal exports 250 tst. January soybean range was 8.64-8.84. World numbers suggest SF should not trade over 9.00. Lack of farmer selling could limit the downside below 8.50 until more is known and US and China trade and 2019 South America supplies. Today corn and USDA was a four letter word. Lets start with the confusing number. Trade estimated World 2018/19 corn carryout near 158.8 mmt vs USDA October estimate of 159.3. 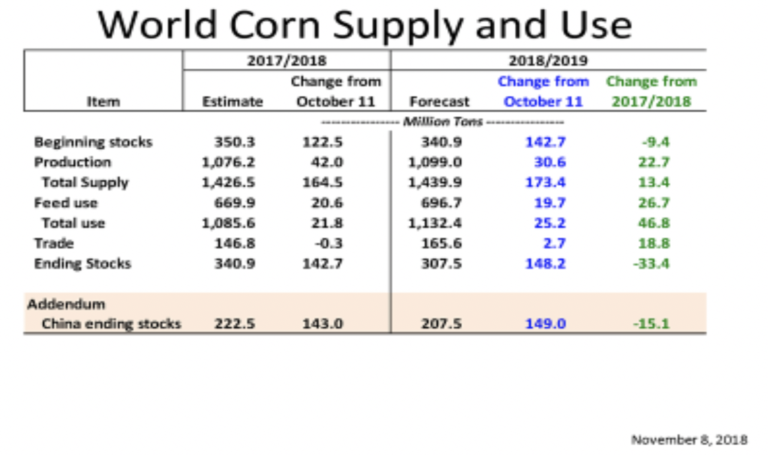 USDA estimated World corn stocks at 307.5 mmt. This due to upward revision of China data going back to 2007. Take out the 149 mmt USDA increased China from last month and stocks minus China was 158.0. USDA raised next years Argentina crop 1.5 mmt, lowered EU 1.5 and raised China 31.0. Average guess for US 2018/19 corn carryout was 1,773. USDA October estimate of 1,813. USDA November estimate was 1,736. Crop was down 152, feed was down 50 and exports were down 25. Weekly US corn export sales were near 27 mil bu. Total commit is 887 vs 763 ly. USDA new goal is 2,450 vs 2,438 ly. December corn range was 3.66-3.79. Lower US crop should limit the downside below 3.66. There should be farmer selling above 3.80. Wheat futures closed lower. December Chicago range was 5.03-5.17. Hope that USDA might lower World end stocks offered support early. Fact they raised the carryout triggered some long liquidation. 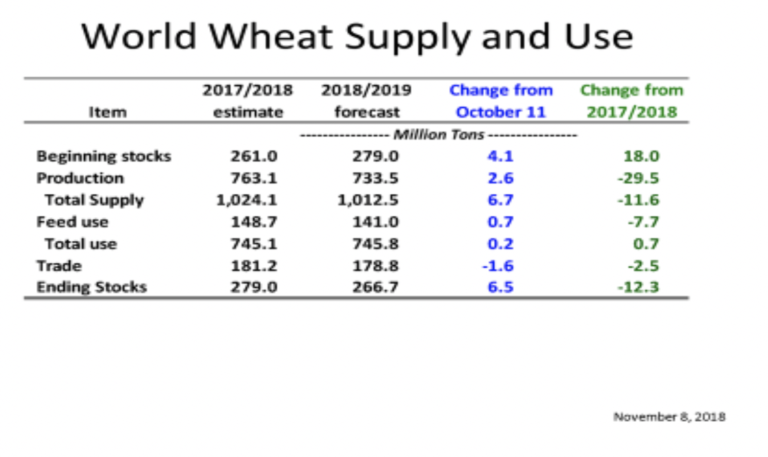 USDA estimated the World 2018/19 wheat carryout near 266.7 mmt vs USDA October estimate of 260.2. USDA lowered Australia crop 1.0 mmt, Ukraine .5 but raised China 4.5. USDA est US wheat carryout near 949 vs 956 in October. Weekly US wheat export sales were near 24 mil bu. Total commit is 506 vs 598 ly. USDA goal is 1,025 vs 901 last year. Wheat bulls still hoping that eventually Russia will reduce pace of exports. Still funds are not interested in buying wheat until they see that headline.